The White House doubtlessly is happy that the unemployment rate has dropped to 8.5 percent, in part because the President is much more likely to get reelected if voters think the economy is heading in the right direction. But the latest drop in the unemployment is not unambiguous good news for the Obama Administration. Before explaining why, let’s take a brief detour and look at how the unemployment rate is calculated. The key thing to understand is that there are two moving parts. First, the government estimates the number of unemployed people. That’s the obvious part of the calculation. But in order to calculate the unemployment rate, the government has to estimate the size of the labor force. But this is not a simple number to calculate because many people who could work – such as women with young children, students, people approaching retirement age – sometimes decide that their time could be better spent doing other things. So the government has to look at all the people who don’t have jobs and guess how many of them would like to work. With this in mind, let’s look at the unemployment rate. The simple way to think about unemployment numbers is that the joblessness rate can rise or fall for good reasons and bad reasons. If the unemployment rate drops because hundreds of thousands of jobs are being created each month, that’s obviously good news. But if the jobless rate falls because the government estimates that lots of people have become discouraged and dropped out of the labor force, then that’s not good news. In other words, sometimes the unemployment rate, by itself, doesn’t tell the full story. That’s why one of the best statistics to look at is the employment-population ratio, which measures the number of people who have jobs and compares it to the number of people who could have jobs. And by this measure, the Obama White House can’t be very happy. 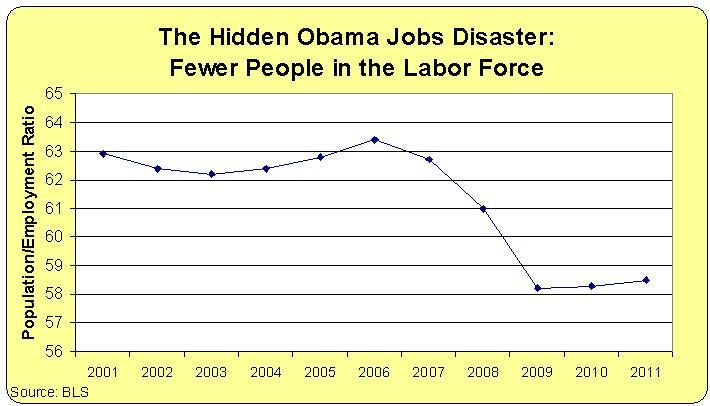 As illustrated in the chart, the job numbers have barely begun to recover. This is a woefully under-reported piece of data. A few news outlets do mention the phenomenon of “discouraged workers” dropping out of the labor market, but only policy geeks like me seem to pay attention. But the employment-population ratio does have real-world implications. The economy’s overall level of output (i.e., national income, gross domestic product, etc) depends on how many people are working. And that is what determines whether living standards are rising, falling, or stagnating. This is why the Obama Administration can’t rely of a falling unemployment rate. As I’ve explained elsewhere, the American economy appears to have suffered a permanent loss of output in recent years. So what does this mean, for those of you who care about political implications of economic statistics? The honest answer is that I have no idea. But since living standards are still stagnant, a falling joblessness rate won’t necessarily translate into a victory for the incumbent party.